There is no better way to take advantage of trying a new restaurant (or anything really) than getting that tantalizing email from Groupon. Since we didn’t even know about this restaurant before , we jumped on the opportunity to try it out so that we could share our experience with you. 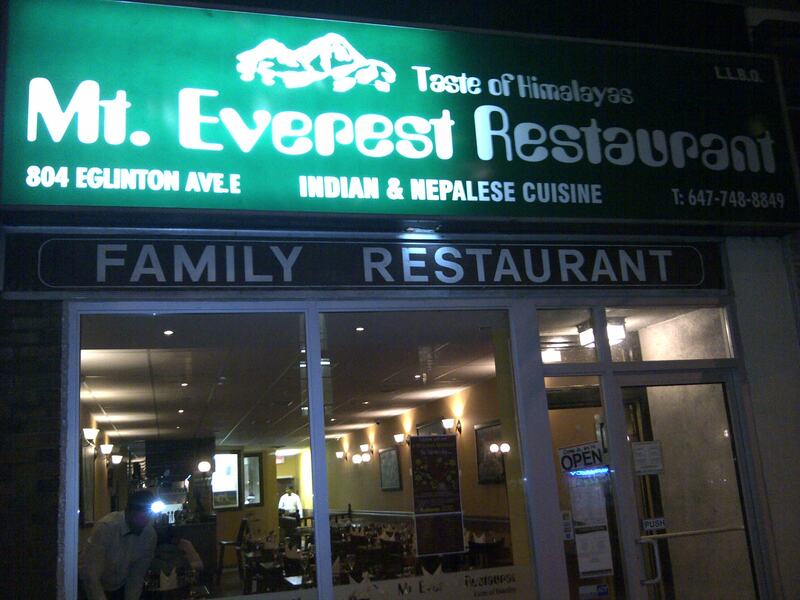 Mt Everest Restaurant has 2 locations – one at 469 Bloor Street West, and another at 804 Eglinton Avenue East. The voucher that we purchased was redeemable only at the Eglinton location. Mt Everest specializes in Indian and Nepalese cuisine. We were both familiar with Indian cuisine, but Nepalese we had to try! The restaurant is very quaint and adequately sized for the location (Eglinton and Laird). It was very clean and spacious, with paintings of the Himalayas on the walls. Each table had a small vase with a red carnation which added a nice touch to a simple decor. The washrooms – located downstairs – were full single-person bathrooms (4 powder rooms in a row), which you hardly see in restaurants. We were pleasantly surprised by how clean and spacious even that area was. We must mention the black and white uniforms complete with bow ties! It added a nice touch of cuteness (although we’re sure they may be going for classy). The staff was very pleasant and attentive; an empty plate did not sit in front of us for longer than 60 seconds. They showed a genuine patience even when we asked the same question more than once… or twice, and didn’t show any sign of feeling slighted because we were attending with a voucher. With the voucher, we were entitled to: 1 appetizer, 2 entrees, 2 sides (1 bread, 1 order of rice) and 2 desserts. 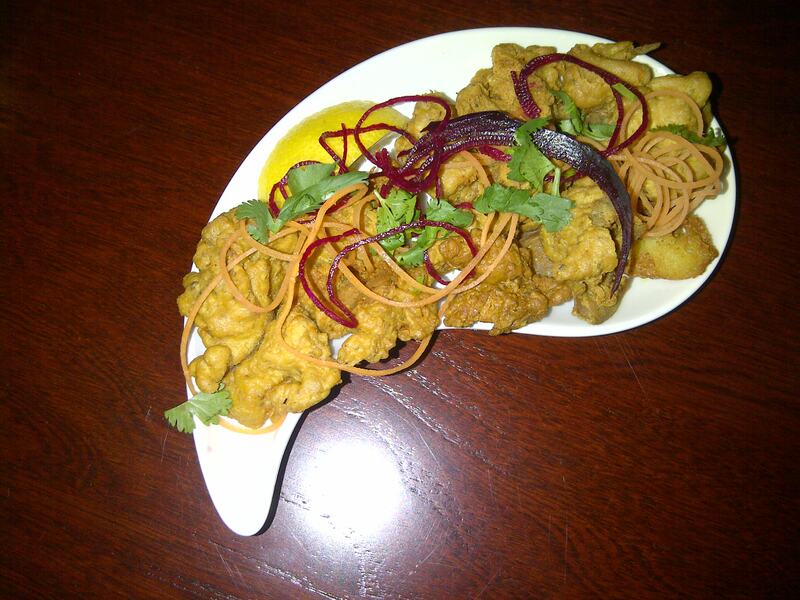 Appetizer: Chicken Pakora – Marinated pieces of chicken dipped in batter and deep fried. This was accompanied by 3 sauces – mint, tamarind and mango. The chicken tasted well seasoned and the batter did not take away from that. The pieces were a decent bite-size and the sauces added a great flavour. However, if eaten without any sauce they were still enjoyable. Kukhura Ko Maasu (Chicken on the bone) – chicken cooked in typical Nepalese village style, with local spices and herbs.The chicken was moist and fell right off of the bone, with the herbs and spices not overly done. There was also a slight sweetness to the sauce which fused well with the spicy flavour. 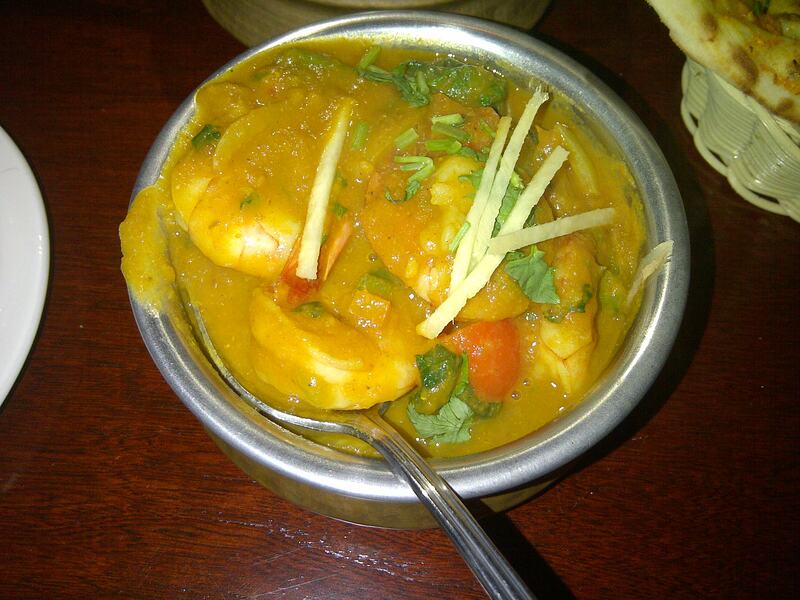 Shrimp Jalfrajee – Shrimp sauteed with fresh green vegetables, ginger and garlic, cooked in a tomato sauce with Indian spices. This was a delicious tomato based dish that was well seasoned and features a good amount or large , perfectly cooked shrimp. Chunky onions and spinach added both texture and taste to this yummy entree. We accompanied our meal with garlic naan and steamed basmati rice. 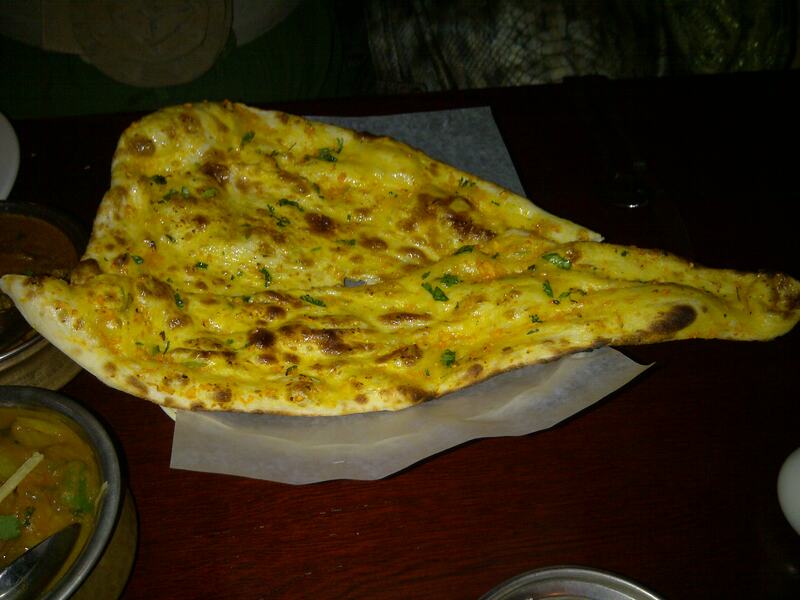 The naan was phenomenal, freshly made with lots of delicious garlic. The rice was a welcome accompaniment to the flavourful sauces in our chosen entrees. Ras Malai – Cottage cheese patties dipped in sweet and creamy milk sauce flavoured with saffron and rose water. This dessert was a first for both of us. We were pleasantly surprised to find that for cottage cheese, it was very flavourful and not overly sweet. The rose water and saffron were a nice blend with the normally bland cheese. 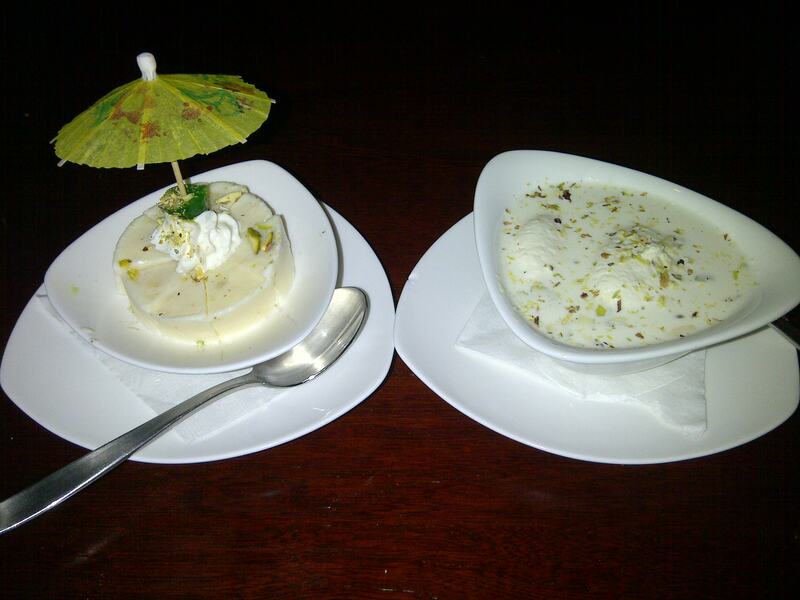 Kulfi (Pistachio) – Traditional Indian ice cream. This features notes of pistachio and ginger. It was a tasty and refreshing end to the meal. The voucher was $29 for a 3-course meal for 2 people, which is an excellent value. The regular menu prices ranged from $5 (appetizers and desserts) – $15 (entrees) which is comparable to other restaurants offering this type of cuisine. Portions are good so even without a voucher we feel you would certainly be getting your money’s worth. We thoroughly enjoyed our dining experience at Mt Everest. The food was excellent and the staff , attentive and welcoming. 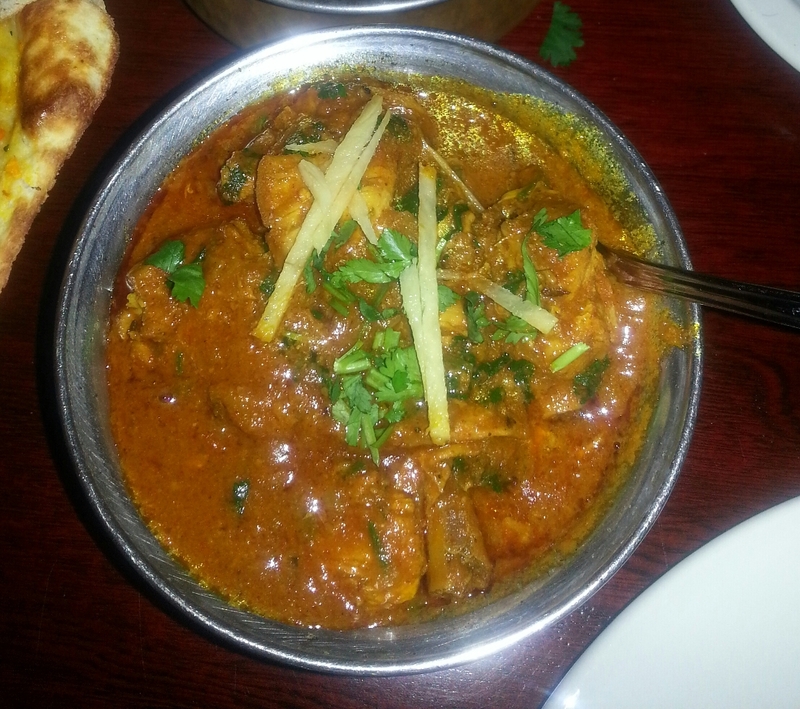 If you’ve been looking for some place new to give a try, or enjoy Indian food, we don’t think you will find yourself disappointed with what Mt Everest offers. Let us know if you have dined at Mt Everest or, you plan to give it a try after reading this. We want to hear all about it, so leave a comment below! Mt Everest Restaurant locations are: 804 Eglinton Ave E (647) 748-8849 and 469 Bloor St W (416) 964-8849. Cool new place to try! Cheers! And speaking of cute things….the mini-umbrella in the dessert?! Adorbs! I love this restaurant! I haven’t tried the main dishes you ordered though, so I will have to try them next time I’m there. Thanks for the review and the pictures – I wanted to eat them!